Mirabella Retirement Community | Cary Kopczynski & Company, Inc.
Mirabella means “beautiful vision” in Italian. This thirteen-story, 730,000 square foot U-shaped structure contains 320 independent living units, 13 assisted-living units, 44 skilled-nursing units, 22 dementia care units and offers state-of-the-art amenities for its residents. Mirabella also features an enclosed, secure courtyard for residents’ activities, an auditorium, a library, an exercise facility with an indoor lap and therapy pool, and a 10th floor regal dining room. There is also one subterranean parking level with a 334 car parking capacity, integrated with individually operable mechanized car lifts. 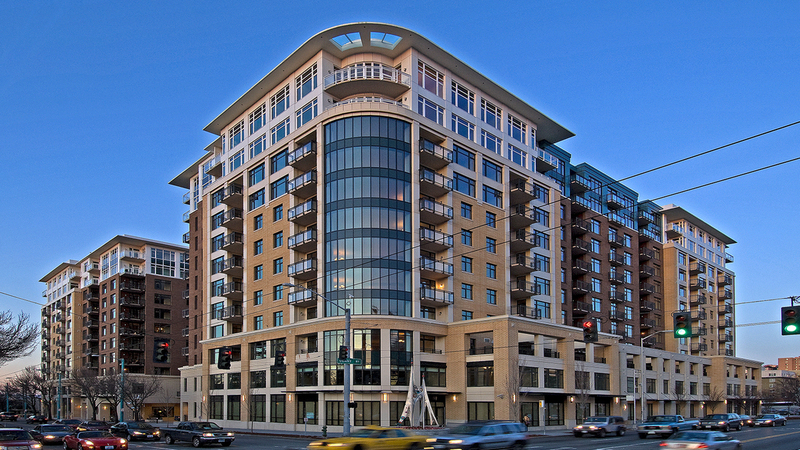 The structural design for Mirabella was prepared with buildability and construction speed in mind. The use of cast-in-place post-tensioned concrete with the specified low shrink mix, optimal closure strip layout, and column-hung forming system provided a distinctive schedule advantage. Low shrink concrete reduced the number of closure strips and slab pours per level. This maximized the pour size and shortened the overall construction schedule. The column-hung system allowed the overall construction schedule for the concrete frame to be reduced by two months, out of a previously budgeted thirteen month schedule.